A foodie, or the gourmet, or the gourmand? - Of or characteristic of a gourmet, esp. in involving or purporting to involve high-quality or exotic ingredients and skilled preparation: gourmet meals; gourmet cooking. - Elaborately equipped for the preparation of fancy, specialized, or exotic meals: a gourmet kitchen. - A person who is fond of good eating, often indiscriminatingly and to excess. - A person keenly interested in food, esp. in eating or cooking. What would you call yourself, a foodie or the gourmet or gourmand? Well, I never would have thought about it until few months back when I was asked the same question by my colleague and then dear blog friend. All I knew was I loved food, both cooking and eating it. I would rather have a big plate of food which makes me feel good and content than sampling few tea spoons of fancy food. I would rather go for a double cheese burger or pizza with bunch of my friends’ right in front of the TV than eat three course meals at some quiet fancy restaurant. I would rather drink a bowl of hot ‘n spicy Rasam than sip some fine wine and I would gladly eat Curd rice with pickle than taste samples of fine cuisine. It means my love for food is not restricted to fine gourmet cuisine although I do love to indulge myself sometimes. Whenever I think of food, I crave for some homemade simple foods than fancy eye candies. It’s the simple, comfort food that makes me happy and warm when I am hungry. So I can happily say that I am a foodie through and through. Well, what else would you call a person who talks about food, daydreams of food and loves to cook food? A foodie right? And to top it all my blog is dedicated to foodie’s food :) So what would you call yourself? A foodie or the gourmet or the gourmand? Life’s been hectic since couple of weeks and Krish and I are spending very little time in kitchen during weekdays. When life gets hectic and you don’t have enough time to itch your a$$, all you want to cook and eat is something which is quick yet tasty. Spending little time in kitchen doesn’t mean that we are hogging some burgers and wedges or frozen pizzas (I am on diet remember?). Far from that we are eating some healthy food. Again, healthy food is not restricted to green salad or fruits tossed in our bowl but some sinfully delicious food with a touch of exotic spices. I had a big batch of frozen Tofu Stuffed Kulchas in freezer and it was begging to be eaten with some spicy curry. All I was left in fridge was a box of button mushrooms and tomatoes. With quick brainstorming session, Krish and I ended up making this Spicy Peas-Mushroom Masala which tasted great with Kulchas. The crisp onions and tangy tomatoes were well balanced with chewy mushrooms and exotic spices. Do give it a try if you love mushrooms and peas like me and I can guarantee that you won’t be disappointed. Heat oil in a pan and add cumin seeds and curry leaves to it. Add sliced onion and chopped garlic when cumin seeds start to sizzle and sauté it on medium flame till onion turns translucent. Add chopped green chillies and ginger and sauté it for about 30 secs. Mix in quartered mushrooms and sauté on medium flame for 2-3 minutes till the mushrooms are wilted and wrinkled. Mix in green peas, chopped tomatoes, tomato paste and salt to taste and cook for about 2 minutes on medium flame till tomatoes get pulpy and releases its juice. Add chilli powder, turmeric powder, black pepper powder, garam masala and kitchen king masala and mix well. Cook for another 4-5 minutes till all the flavours blend well. Add kasuri methi and juice of half a lime and mix well. Cook for another two minutes on a reduced flame. Serve hot Spicy Mushroom Curry garnished with chopped coriander leaves with Roti/Kulcha of your choice. wow, it looks so yummy! Nice pics. That's a good recipe. I don't take mushrooms, but my husband does. A great recipe to surprise him. Thanks! I am planning to make one for your event too, still got plenty of time. Kulcha looks good even after defrosting, great idea to make a big batch and freeze.Good job. Check Aroma for Thalipeeth, my style. I'm a huge fan of mushroom curries and this one sounds perfect! Every time I think I have found my favorite, I come across another version I can't await to try. Delicious mushroom dish. I love mushroom. I think i am a foodie. You on a diet, me too actually my hubby is on a diet and i thought i will join him up for the loosing the kilos i gained during the christmas period. Oh and i use the same font for my blog header. I love your blog. I should visit it more often. I'll do that, I have more time now. Oh I love the richness and the spiciness this has. Now I need some! Oh sorry - I think I am a bit of both the foodie and the gourmand. I'd like to think of myself as a gourmet but I still have a lot to learn to be titled a connoisseur. thats long queue of foodies here;) thank u for ur kind words! I am a Foodie sia :)) . 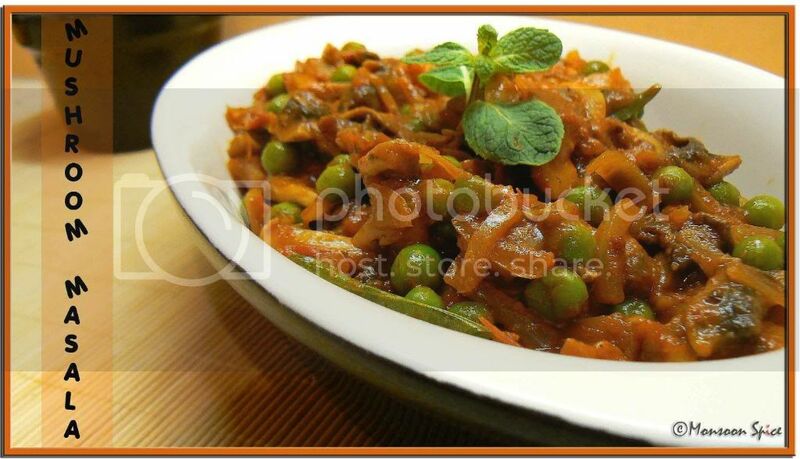 nice idea to make mashroom with peas.... must be tempting :) . thanks for sharing the curry recipe, D is great mashroom fan, for me errrrrrrr...... , if i will show him this , i guess he himself will try his hands on it :D.
What beautiful pics... mouthwatering indeed. The pic looks exactly the same as I see it in one of my fav restaurants here. :D Thanks. Will reply to your email soon. Sia, the text is running into the frame and I'm only able to guess the endings of each line. Is it just my computer? And trying not to be a gourmand. abt that question...you have a doubt on that?..you a foodie and your friends who visit you have to be one right!...you know I clicked that hearty halwa at 3 am...so what else can I be?? hi sia! i wud like to admit that iam aproper foodie.coming to this recipe....i will say i love mushrooms and i make the same dish just that i dont add curry leaves and kitchen king masala.this time i am going to make your way and let you know. i checked it by changing my screen resolution but it seems ok to me. can u please let me know which browser u r using? u dont like mushrooms???!!!! now thats really surprising:) u can use cooked cauliflower or potato and cook same way. it tastes delicious. can u please check again later and let me know if u still have difficulty in viewing the pic? 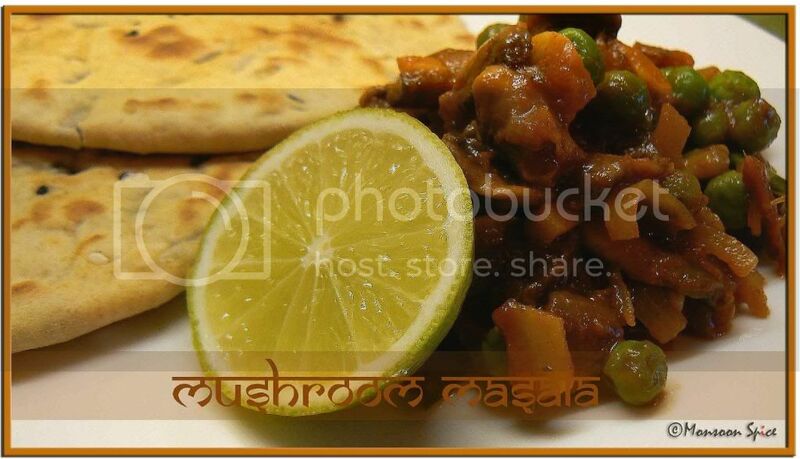 Sia - Kulcha & Mushroom peas masala looks yum! Great photo & Presentation....Looks lovely & mouthwatering! Beautiful picture!! Looks mouthwatering dear! Foodie all the way! Love the mushroom-matar recipe! With kulchas, it must have made a hearty dinner! Sia, I'm using IE on XP.